This series of lectures was delivered by Abraham Kuyper at the Princeton Theological Seminary in 1898. 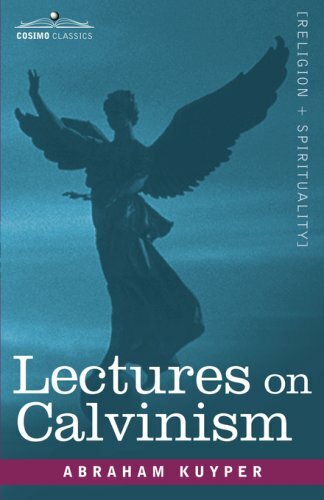 Over the course of the lectures, he discusses Calvinism and the way it pertains to many aspects of life including politics, science, and art. According to Kuyper, Calvinism has a natural affinity for scientific investigation, because like scientific inquiry, Calvinism seeks to unify the cosmos under universal laws. Predestination, he says, proves that a set of laws exist to govern the world, and science is merely trying to figure them out. When it comes to art, Kuyper launches into a defense of Calvinism, which is often maligned as a religion that seeks to stamp out art and its significance. Readers will find here a thorough and elegant explanation of Calvinism and its particular outlook on life. Anyone wanting to know how the religion is unique among the many Christian sects will find it an enjoyable and informative read. Dutch theologian ABRAHAM KUYPER (1837-1920) was prime minister of the Netherlands from 1901 to 1905. He developed Neo-Calvinism, which emphasizes the sovereignty of Jesus over all mental pursuits and supports the idea that there exists a grace given by God to all things in order to sustain the continued unfolding of creation. Kuyper wrote a number of books including Conservatism and Orthodoxy (1870), The Social Question and the Christian Religion (1891), and Common Grace (1902).